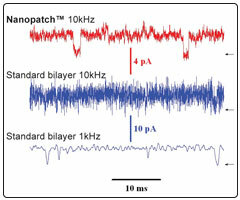 Performance of the Nanopatch™ versus a standard PLB system during cardiac Ryanodine receptor channel (RyR2) recordings. Open channels can be easily observed at 10 kHz on the Nanopatch™ system. At the same bandwidth, the standard PLB system is not able to resolve any activity. Filtering down to 1 kHz on the standard system reveals some activity, but the filtering strongly affects the shape of the channel openings. (All the recordings were obtained at room temperature, with Cs+ as the current carrier. The amplitude of the events obtained from the Nanopatch™ and standard systems vary due to an increased bias used). With reusable QNMs, bundled temperature and pressure controls, and an integrated amplifier, the Nanopatch™ provides the greatest ease of use and the highest performance available at a very low price. We are actively seeking early access customers to collaborate with us on investigating a wide variety of ion channels using the Nanopatch™ system. For more information, please contact us. You can also download a product brochure here.